Amari is just fifteen when strange men appear in her village. They do not look like any people she’s ever seen. Their skin is pale, nearly white, they carry strange sticks and speak a language unlike those she has ever heard. Amari is first weary of these men but soon welcomes them with open arms like her fellow villagers, seeing as they are accompanied by neighboring tribesmen. A night of celebration soon turns into one of anguish as the visitors wreak havoc on Amari’s village. Murdering many and keeping only those they see as able-bodied, Amari finds herself taken aboard on a slave ship heading to the Carolinas. There, she is sold as a birthday present for her new “master’s” sixteen-year-old son. Polly is an indentured servant, hardened through a past of toil. She is working a fourteen year long contract to pay off the debts of her parents. She has a disdain for slaves, but eventually through shared struggle, Polly and Amari build a friendship centered around the hope of one thing… freedom. 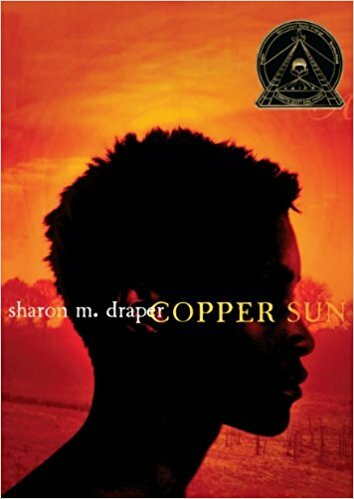 I enjoyed reading Copper Sun. It was an honest take on slavery and incredibly moving. Draper even includes a list of the resources she used in writing this book. All in all, I loved it. Guest review contributed by Educated Negra. An up and coming book blogger, she loves getting books from diverse points of view into the public eye. On her blog, you’ll be able to find book reviews and the occasional poem.